Smart security, smart tea making? Could our new kettle mean better service for our customers?! Being technical people, we’re suckers for a gadget and this is our latest – the iKettle. Now we can boil the kettle without even moving from our desks, fulfilling both our desire for efficiency and love of coffee at the same time! Not only does it boil the kettle remotely (activated by a smartphone) it also keeps the water hot for 30 minutes so if we’re suddenly inundated on the phones (which often happens) we can still make drinks half an hour later without having to boil again. Super impressed? No? OK so it may not float everyone’s boat but it pleases us and in a way it is reflective of how we run the business – always looking for ways to be more efficient and improve what we do. 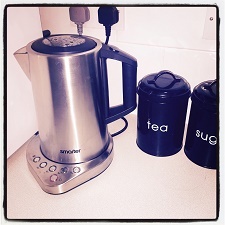 Our 21st century kettle has certainly improved our tea making experience but has it made a difference to our customers? Admittedly, it won’t have the far reaching impact that the new computer system we implemented a few years ago had, however, it does mean we’ve improved productivity and availability in the office – maybe by small margins but, just like for Team GB, all these little advances combine over time to create a faster, better, more thorough service. Plus, have you seen how cool our kettle is?! previous When the boss is away, who looks after security?